Artistic Botox injections from a Violinist? Written by Dr. Calvin Lee, a Board Certified General Surgeon who is also an acupuncturist and violinist. There's quite a bit of information here. It probably borders on too much (sorry, I get carried away at times). Injecting Botox is a combination of science, art, and technique. I placed much of the Botox anatomy information on another webpage. I am probably too heavy on the complications section here, but it's what I worry about so that the patients don't have to. What is Botox used for in the face cosmetically? For the face, Botox is used to treat and prevent wrinkles by relaxing muscles that cause the wrinkles. Botox is administered by a healthcare professional as an injection directed into or around the muscles. It blocks nerve impulses in the injected locations. This relaxes the muscles that causes moderate to severe wrinkle lines. Other common areas are crows feet (sides of the eyes, also called lateral canthal rhytides), and forehead lines. There are many other areas used as well - see chart below. Many of these areas are considered off-label FDA which may be considered appropriate by your Botox injection doctor. I was born in New York City. 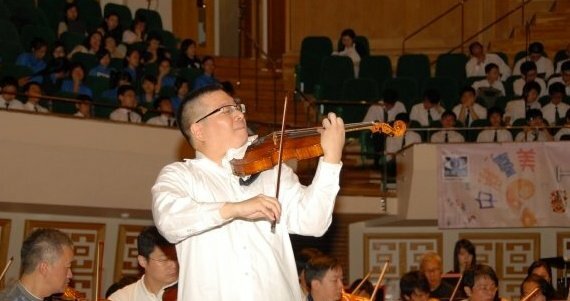 I am a graduate of Brown University where I studied Neurosciences and got the opportunity to play violin at Carnegie Hall for the first time. I was kindly offered admissions to Harvard and all the other Ivy League colleges that I applied to and I had to make a hard decision to go to Brown University. At Brown, I met my wife, Dr. Tammy Wu - thus solidifies the good decision making. Then I went to Brown University Medical School and became a doctor. My wife did the same except that she graduated top of the Ivy League medical school class (no small feat!). Six years after medical school, I became a General Surgeon. 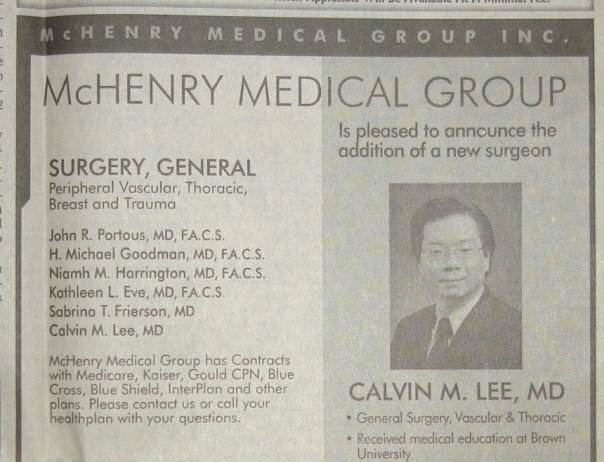 Modesto offered me a great initial job in 2003 as a General and Trauma Surgeon with the McHenry Medical Group. This was my dream job which I had wanted in a town (Modesto, CA) which would have a need for surgeons to practice diversified procedures. I later realized that I wanted more artistry with my surgical skills. Thus I joined my wife, Dr. Tammy Wu, Plastic Surgeon and created Surgical Artistry in 2006. During the transition process, I became an acupuncture through Stanford's physician acupuncture training program. During that time, I got a chance to play violin at Carnegie Hall for the second time with the YouTube Symphony (as their only physician violinist), plus did some touring around the globe on solo violin. I had more hair back then. Modesto Bee. For the most part, you can come however you like and we'll do fine. But here are some pointers to make everything go even more smoothly. Wear minimal makeup or none if possible in the spots that need to be treated (ie. forehead, side of eyes, or frown (glabellar) area). I will be removing the makeup with alcohol to remove germs. This is important to prevent infections. If I mess up your makeup (which I will with the alcohol prep pad), you can reapply with a clean makeup afterwards, but you have to apply very carefully - don't press too hard on the botox injection spots. To do the forehead wrinkles, I will usually need to see the edge of the hairline. Hair pulled back would be great. But I've found that clips which prevent you from resting your head against the headrest of the procedure chair may get in the way of your ability to relax your head against the headrest. I definitely want patients to rest their head against the back of the headrest so that they can relax as much as possible during the procedure and this also prevents any backwards movement of the head so that I can be as precise as possible. Many patients go right back to work after their Botox appointments. But I do not recommend vigorous activity for about 8 hours after the injection because there could be a higher incidence of bruising. Do not rub the botox injected areas too hard for the next 4 days. Treat them gently. You can wash your face, put on make up and sunblock, but don't take your knuckle and rub. Avoid eyebrow waxing for the next 4 days. Avoid face down acupuncture or face down massage for the next 4 days. Skip workout sessions for about 4 hours after the Botox injection to keep the bruising level to a minimum. The cost in our office depends on the number of units. Currently I (Dr. Calvin Lee) charge $12.75 per unit for Botox (pricing subject to change, please call our office to check current prices). Dr. Wu (my wife, the plastic surgeon) can also give Botox injections. She has a different pricing. 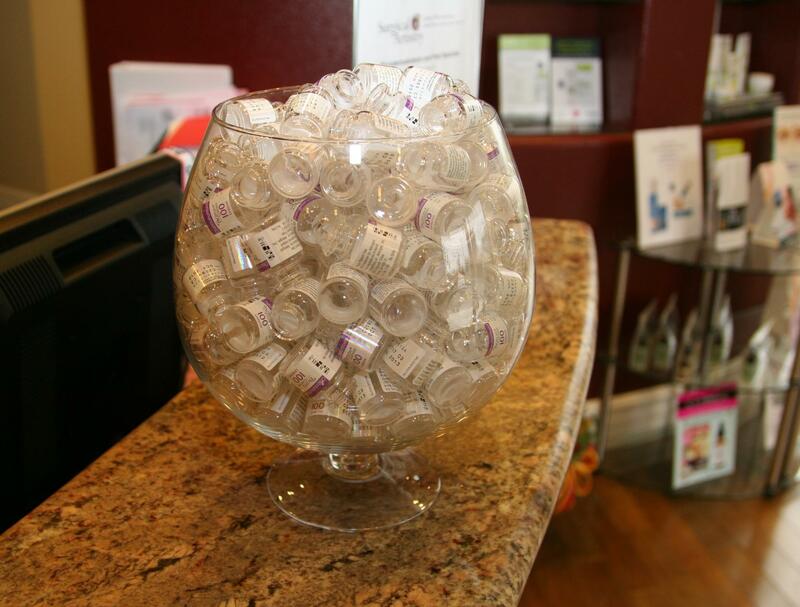 Brilliant Distinctions (BD) is a Botox frequent user program - additional savings! First picture is part of the lobby. 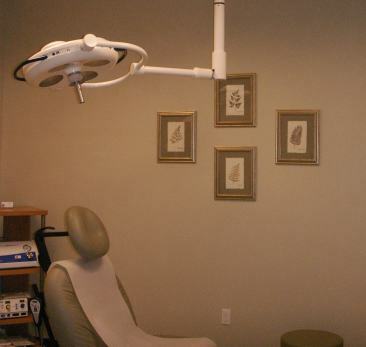 Second picture is my main Botox injection procedure room complete with operating room light and comfortable chair. The third picture is the outside of the office. You can sort of see the edge of the Modesto Sylvan Ave. Post Office. Prices gathered from May 2012, Surgical Artistry, Modesto, CA. The price may fluctuate but the number of Botox units would most likely stay the same. Note only the glabellar area is an FDA approved on-label indication for Botox Cosmetic. The other areas are considered off-label, and require careful consideration of appropriateness with your doctor. The charts are not intended to be used as medical advice or advertising material. They are presented here to be used as medical information only. Note: Botox is different from Dermal Fillers. Dermal fillers (ie. Juvederm) cost about $580 per syringe. For example for the lips, usually one syringe is what's needed. Botox is for relaxing muscles. Fillers are for just that - filling with an injectable gel implant. The majority of patients getting Botox with me is over the age of 30. The average age of all of the patients getting Botox is around age 44. Done by me. I am a surgeon and I consider these injections to be an extension of my surgical skills. In addition to being a surgeon, I am also an acupuncturist - thus I am very experienced and skilled with needles. I carefully select our injection needles as the instruments of the procedure. There are many styles and sizes to choose from. Even within the same specifications, each brand has it's differences. I recognize that needles make a difference in the bruising and patient comfort level. We treat each injection session differently and evaluate facial muscles at rest and with activation. We realize that everyone is different. We have different recommendations for each individual. We have different anatomy - our muscles are shaped differently and have varying strengths from one another, and changes throughout our lives. There are also gender differences. In general men will need more Botox. We do not use "cookie cutter" Botox templates. Botox injections are safe and effective aesthetic treatments. Common adverse effects are mild and temporary. Serious adverse effects are extremely rare. We believe that the we can keep the risks and side effects of Botox low or prevent them by keeping our injection skills at the highest level we can, having great knowledge of facial anatomy, and utilizing individualized injection strategies based on our patients' goals and facial features. Most common side effect is bruising. Other side effects are of a very small percentage but they do occur. And yes, they have occurred in my practice. But I will take great care to try to prevent them from happening if possible. I think the risk of bruising is somewhere between 10-20%. Higher part of the range has been found in the crows feet area. I do apply Arnica gel to areas with bruise potential right after the treatment to help reduce bruising after Botox. Incidence of headaches is also similar to the incidence of bruising (10-20%) as reported by our patients. However, I'm sure there are patients who don't have a chance to tell me, so the incidence is probably not very accurate. Most patients tell us (me included - I get a mild headache after my own Botox injections) that one dose of Tylenol usually treats the problem. I've had 2 patients tell me that their headaches lasted longer than 3 days. But both patients said that they would still continue using Botox. So this headache risk is a possibility. Eyelid drooping (belpharoptosis, or lid ptosis) - is most likely caused by migration of Botox through the orbital septum to the levator palpebrae superioris muscle. This migration could also be caused by excessive pressure on the injected botox sites. Plus, forhead (frontalis muscle) treatment with botox can aggravate subtle prexisting lid ptosis. This risk in our practice is less than 1%. To keep this complication low. Dr. Wu and I keep our injections of the glabella region (area between the eyebrows) at least 1 cm above the bony orbital rim and we don't cross the midpupillary line. We also avoid high volume botox dilutions for injections in this area. Eyebrow drooping (brow ptosis) - is most likely due to low frontalis treatment or overtreatment of the forehead. I usually encourage patients to get a lower dose of Botox for the forehead to prevent this complication. I think our risk of this complication is less than 5% of the patients who get forehead injections of botox. We take steps to keep this complication low by encouraging lower doses of Botox for the forehead for patients who already have a lower-set eyebrow, injecting at least 2 cm above the orbital rim, and we consider adding injections to the crows feet area to help elevate the brows. Double Vision (diplopia) - is most likely due to medial migration of toxin to the lateral rectus muscle. I take steps to avoid this by keeping crows feet injections on the shallow side. So far... (hopefully I will not have to revise this statement), I've had one patient complain of blurry vision after Botox, but she also had eye surgery the week after Botox injections. She wasn't sure which to blame the blurry vision upon. She continues to get Botox from me, but has not had any blurry vision since. But I will always remain cautious. Seeing is believing website from the makers of Botox. These pictures are for the glabella complex of muscles (area between the eyebrows). Everyone's wrinkles are different. Some results are best seen after multiple sessions with Botox. And many patients are interested in keeping dynamic wrinkles from becoming static wrinkles. Dynamic wrinkles are wrinkles which appear when muscles are activated. Static wrinkles are present when the muscles are as relaxed as possible. Dynamic wrinkles naturally tend to become static wrinkles. Botox works right away on dynamic wrinkles. Botox takes time to work on static wrinkles and may never "erase" them. I (Dr. Calvin Lee) am the main injector. Dr. Tammy Wu can also inject with special request. She was the one who originally trained me to inject Botox. I have since taken on the art of injecting Botox with passion (bordering on obsession). In 2010, I have surpassed Dr. Wu's lifetime number of Botox units injected. 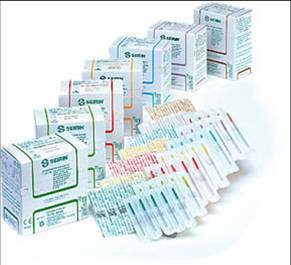 As mentioned above, many of these injections are considered "off-label" FDA uses of Botox. The list here is for informational purposes only. We don't recommend getting Botox during pregnancy or breast feeding. We don't carry Dysport (abobotulinumtoxin A) or Xeomin (Incobotulinumtoxin A) at this time. We are very satisfied with the results and expectations with Botox (onabotulinumtoxin A). And we provide our patients with the opportunity to sign up for the free Brilliant Distinctions program which allows patients to earn points and significant coupons, rebates, and discounts on Botox. 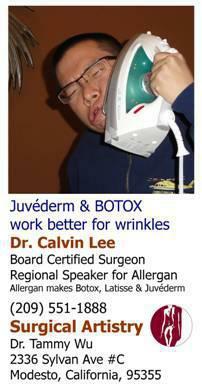 Surgical Artistry (Dr. Lee and Dr. Wu) obtains Botox directly from Allergan, USA. We understand that there is press regarding unapproved or counterfeit products. In fact, we get solicitations from various shady sources, so we know that these products exist. It is our goal to provide only the highest quality product, thus our distributor is the company that makes and owns Botox (Allergan). 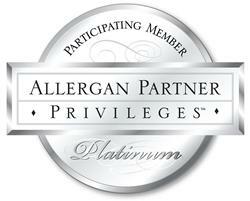 In fact we are given the platinum level from Allergan. This is based on the amount of products ordered from Allergan each year. They tell me that Platinum level is their top 1%. I do not operate this program. The page describes what is known about the program and it changes from time to time. We are members of Brilliant distinctions because we want our patients to get the best value for their Botox, Juvederm, and Latisse purchases. The discount/rebates are offered through Allergan - the makers of Botox, Juvederm, and Latisse. Currently you get points worth about $20 per visit, which you can earn/redeem every three months. Three months is roughly how long Botox effects last. 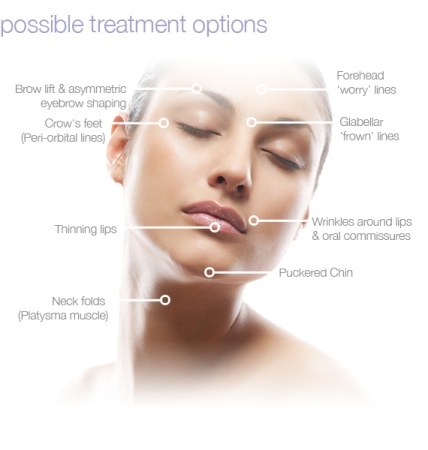 Botox Cosmetic - the official Botox page by Allergan. Lots of information here. I have been told by my patients that I would scare away new patients with this picture (I hope not, I am not a scary person - usually not). But I figure I have to impart some fun while I poke about 500 needles into patients in the course of a day. My goal is for my patients to say that they look forward to visiting my procedure room. Don't try this at home, I got in a whole lot of trouble with my wife for messing up the iron with oils from my face. Plus if the iron is hot (which it isn't in the picture), you would burn yourself very badly and permanently. Thank you for reading my blurb on Botox above. I hope you will consider my botox injections a "jab" well done. 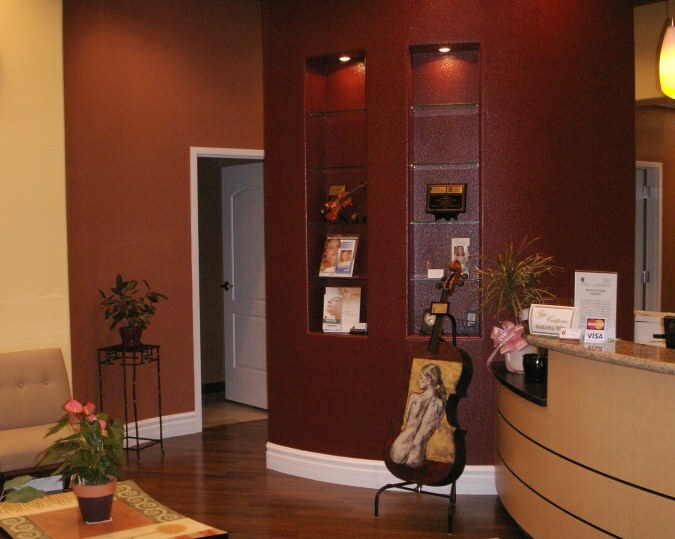 Calvin Lee, MD - Surgical Artistry located at 2336 Sylvan Ave, Suite C, Modesto, CA.